Hi! I am an ESL teacher who loves this site. It´s great to have and share the wonderful work from other teachers. 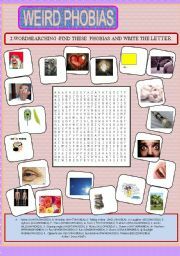 Wordsearching and matching activity about certain phobias (health, death, senses and animals). Password is a very famous tv programme in Spain. I use this activity in my classrooms and it is always very successful. My students love it. Try and tell me about it. THANK YOU! First term final test for 1º bachillerato. 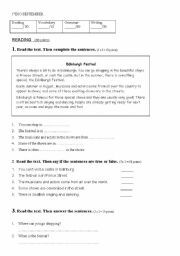 It includes (vocabulary, reading comprehension, grammar and writing sections). Merry Christmas to everybody. 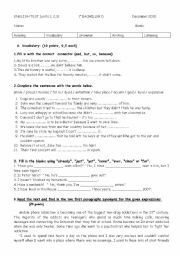 THIS IS THE FINAL EXAM FOR SPECIAL NEEDS STUDENTS WHO ARE IN 2ºESO. 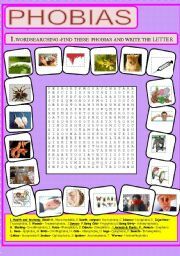 IT CONTAINS READING COMPREHENSION QUESTIONS, VOCABULARY EXERCISES, GRAMMAR AND WRITING EXERCISES. Practice on connectors. 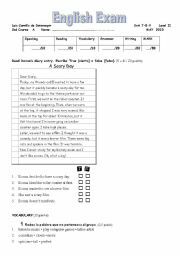 Students can use these exercises to write their own compositions about a past story and the difference betweem living in the country or in the city. 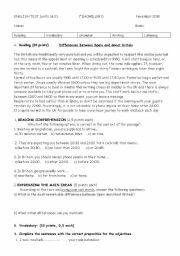 November 1ºbachillerato exam, it includes reading, grammar, vocabulary and writing sections. 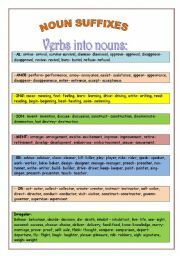 This ws is a complete list of noun suffixes, verbs turned into nouns and adjectives turned into nouns. 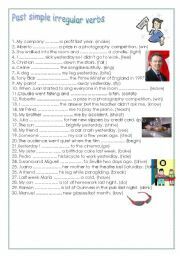 It can be very useful for intermediate level students.